Oregon’s Lower Willamette Spring Chinook Biting Now! The Willamette River is expecting 70,000 spring Chinook to return for the 2016 season. This is a decent expected return and gives anglers hope for a solid fishery. 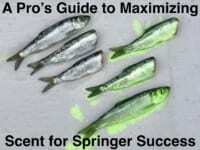 From April to June it will be Springer Madness on the Willamette. Spring Chinook is the most prized salmon in the Pacific Northwest. In my opinion the good snowpack and wetter winter and spring paves the way for a better season. Unlike last year these factors are likely to lend a hand to water temperatures staying in a more ideal range into mid May and hopefully early June. I like to see temperatures stay below 60 degrees and 51-55 seems ideal. We’re going to breakdown the river and focus on how to target each section from Multnomah Channel, to the Harbor and finally Oregon City. Salmon are being caught now and it’s only going to continue to improve. The run will peak in mid April on through May. The channel starts near Fred’s Marina (below St. John’s Bridge) and enters the Columbia River close to Scappoose Bay Marina, which is near St Helens. I fish the Multnomah Channel as long as I can, which is generally mid May. However, if water temperatures stay below 65 degrees salmon remain into June. Trolling downstream is the best method in the channel. Multnomah is nice because it’s small, the fish get focused and locating a bite is easier than on the Willamette. On the other hand, keeping gear on the bottom is vital. If you haven’t adjusted your depth in 10 minutes you’re probably not on the bottom and not in the strike zone. You need to micromanage the bottom and be on it all the time. Standard trolling set ups apply. We’ll likely use 6-10 ounces of lead and a Short Bus flasher followed by a Natural Fire Brine plug cut Green or Red Label Point Defiance herring. Stretching from St. John’s Bridge to Downtown Portland this section is special because you can see high-rises while battling spring Chinook. The Harbor is 60 feet deep in many areas and because salmon tend to move high in the water column we troll suspended. Herring and prawn spinners work best. I prefer herring early in the season. However, as the water warms, the prawn spinners take most strikes. I cure my prawns with Red Nectar, Red Fire Cure and Natural BorX O Fire and anise and you’ll see how awesome they work. (I robbed this cure from Duane Inglin). Trolling consists of a Short Bus flasher, 8-10 ounces of lead and a Chartreuse, Natural or Blue Fire Brine herring or prawn spinner. We will run several colors of brined bait in this area and all will work. The color changes daily. Blue works good early in the morning, chartreuse works good later and natural works all the time. Keep in mind, I’m mixing a tiny bit of Chartreuse and Blue Fire Dye with the brine. It’s best to start at roughly 15 to 35 feet on a line counter. Once you mark a few fish, adjust accordingly. Upstream from The Harbor is the Oregon City Falls area, which is best fished in May. This competitive fishery is where large and tight congregations of boats gather. Being able to operate a boat in crowded water is imperative. Meanwhile, be prepared. The sea lions are bad. In 2015 many guides experienced multiple fish lost per day due to these aggressive beasts. Success is defined by having good bait and avoiding sea lions. Back bouncing and fishing a diver and bait are the norm. Water flows can make it tough at times, but the fish stack here. When fishing this area I’ll bring two types of cured eggs: a sweet and hot egg. 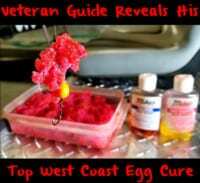 I use Red Fire Cure roe for my hot egg and Red and Pink BorX O Fire for my sweet bait. It’s also important to fresh sand shrimp. For more information on Kyle Buschelman and Willamette Valley Outfitters please visit https://www.facebook.com/WillametteValleyOutfitters or www.willamettevalleyoutfitters.com.